Ingersoll-Rand operates in a sector set to grow in 2017 and its stock offers investors a compelling mix of growth and value. Ingersoll-Rand plc (NYSE:IR) stock rose more than a third last year, but is there room to run in 2017? Let's take a look at three of its growth drivers this year, including an analysis of outlook given by its main competitors in its key climate segment. There's a lot to like about what management is doing with the company and the stock deserves careful consideration. Ingersoll-Rand generated 85% of segment income from its climate segment in the first nine months of 2016, and as you can see below, it's the key to future growth. All blue sections of the pie chart are part of the climate segment. The following table summarizes the 2017 outlook given by competitors in analyst presentations in December. Ingersoll-Rand's Trane competes with United Technologies Corporation's (NYSE:UTX) Carrier and Lennox International Inc.'s (NYSE:LII) HVAC operations. Both rivals gave a positive outlook on end markets in 2017. Data source: Company presentations. Chart by author. Although Ingersoll-Rand hasn't given its 2017 outlook yet, in its third-quarter earnings presentation management said, "We continue to see mid-single digit growth in N. America HVAC going forward." In a demonstration of its competitive strength, Ingersoll-Rand claimed its commercial HVAC bookings were up in the high single digits in the third quarter. The only fly in the ointment is the transport refrigeration -- Ingersoll-Rand's Thermo King is a leading player. United Technologies expects flat markets for transport refrigeration, and Ingersoll-Rand's management believes it could struggle to grow profits at Thermo King in 2017. Having started the year expecting climate adjusted operating margin in the 13.25% to 13.75% range, Ingersoll-Rand now expects 14.5%. It's an impressive performance and there could be more to come because Trane's margin appears to below its competitors. For example, Lennox is targeting residential HVAC segment profit margin of 18% to 20% and commercial HVAC of 17% to 19% in 2017, significantly above Ingersoll-Rand's comparable figure. Meanwhile, United Technologies's climate, controls, and security segment (which contains Carrier) has an operating profit margin of 18.1%. It's likely that Ingersoll-Rand plans to increase climate margin again, and it still has a way to catch its peers, so look out for any commentary on it when management gives its outlook for 2017. Turning to the industrial segment, most forecasters are predicting a return to industrial production growth in 2017, and management believes its industrial segment operating margin troughed in the second quarter and conditions will improve this year. 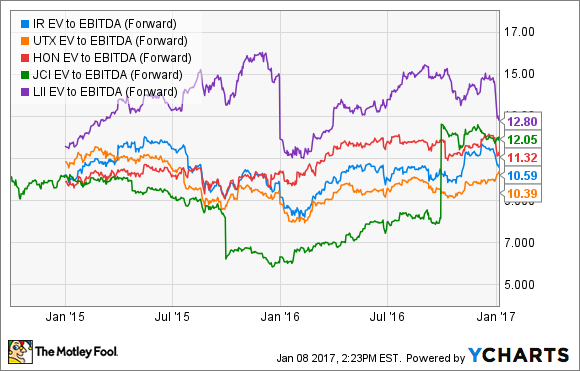 The best value stock in the HVAC sector? Frankly, the HVAC sector looks like a good one to be invested in for 2017, and Ingersoll-Rand is well positioned to grow in the future. Thermo King and the industrial segment are likely to dampen earnings-per-share growth in 2017 to just 6.2% according to analyst estimates, but they expect EPS to grow at nearly 11% in 2018. Turning to valuation matters, here's a chart of forward enterprise value (market cap plus net debt) to earnings before interest, tax, and depreciation. It's a useful way to compare companies with different debt loads. IR EV to EBITDA (forward) data by YCharts. United Technologies is cheaper, but it has near-term earnings headwinds and is far from being a pure-play HVAC stock anyway. Meanwhile, Ingersoll-Rand is at a clear discount to Lennox International and other peers in the industry. All told, the stock is attractive and offers a nice combination of good valuation plus growth prospects.